Science fiction loves itself some doppelgangers: Clones, alternate universes, robot replacements, possession... It's hard to come up with anything that hasn't resulted in new versions of familiar characters. Sometimes, they're a little too interesting, and they leave us wanting more. Here are the ten that should have stayed. Now, as we're discussing replacements and what happened to them, be aware that spoilers start here. No one liked Neelix. No one. And the character of Tuvok was a very under-utilized characters in Star Trek: Voyager. So it's not exactly surprising that one of the btter episodes featuring either character was one where they didn't appear as themselves, but as the combined character of Tuvix. Because he was the focus of the episode, Tuvix was fairly three-dimensional. And Tom Wright gave a good performance in what should have been a typically absurd Star Trek transporter accident. Finally, it would have been nice to have more than a montage to follow Tuvix's integration into the crew. This is a straight-up case of a show presenting a version of Rodney McKay that appeared to have none of McKay's bad qualities. Rod came through from another universe to stop our McKay from continuing an experiment that was destroying his home. Doing that trapped him on the other side of the bridge, but he quickly proved to be a McKay with none of the social problems of the original. Losing the original McKay would have been a shame, sure, but it's hard not to want the one who appears perfect. Owlman isn't a straight example of the alternate self trope, since he isn't Bruce Wayne. But his background makes him very close: He's Bruce's brother, Thomas Wayne, Jr., with Bruce joining his parents in tragic death. Instead of becoming crusading good guy Batman, Thomas becomes supervillain Owlman, uniting Gotham's underworld with a similarly now-evil James Gordon. In Batman: The Brave and the Bold, Batman and Owlman end up switching universes, leading Batman to team up with both the alternate hero-version of the Joker and his Joker (who doesn't want the competition). Just to have the Joker explore becoming good, even for a little while, it would have been nice for Owlman to stick around. Let's say that The Middleman survived beyond its first season, as it rightly should have. There were a number of alternates introduced in the series finale "The Palindrome Reversal Palindrome," but one of more ingenious twists was the revelation that the mirror-version of Manservant Neville was a good guy. When Wendy Watson ends up in The Middleman's version of the Mirrorverse, it seems clear that Manservant Neville, who she's met in her world, is an evil dictator. But when she does find him, he's actually a good guy. Mark Sheppard so rarely gets to play purely good characters that him being a hero officially counts as a twist all its own. It's something we want to see more of, and it would have been great to put the good Neville into the proper universe and send the evil one to the timeline he belongs in. Sometimes, it just makes sense to keep the one with more control and better powers. Plus, despite supposedly having no morals, Bizarro had moments of heroism. He even developed real feelings for Lana. The arc of Bizarro slowly integrating himself into Clark's life and bucking the expectation that he knew nothing but survival was an interesting one, ended by his death. Stargate really loved the alternate self trope. They used it in all its permutations: clones, alternate universes, time travel, android replicants. So there are a number to choose from. But the version that sticks out the most is Dr. Carter. A number of alternate Carters ended up not being in the military, but as pure scientists. Not that the regular Air Force Carter wasn't a great character, but Dr. Carter brought a different dynamic to the proceedings. Daniel Jackson started the show as the team's nerd, but as the show went on, he became much more comfortable with the military dimension of the team. So replacing Carter with Dr. Carter at some point would have been an interesting avenue to explore. The original characters would have had to change their expectations. Dr. Carter would have had to go through a steep learning curve. And the epic UST that Carter and Jack O'Neill had going on would have broken out of its holding pattern in some way. [Tom's] much less confident than Will. But he's also tender and sweeter. I think I like Tom better. "For what it's worth, I believe the wrong Arturo slid," he says matter-of-factly. "And he was the one with the implant." "The way I was going to do it, Invasion was intended to be the season finale. I also referenced the Kromaggs in Post Traumatic Slide Syndrome until we cut it. I wasn't sure what to do with the two professors, but I would've probably left the real one on the world with the Azure Gate Bridge. He would've had the implant and the Kromaggs would have showed up there. "Unfortunately, it went on for too long. I didn't want the wrong professor to be with our group forever. It was one of those things that was forgotten. "I don't like how FOX wanted writers to think with closed minds," he adds. "If I had to write the Professor out — which I wouldn't like in the first place — I would have made a real character episode where the Professor finally admits to being a fraud, the wrong one, and the Sliders go on knowing the real one is trapped somewhere. I wanted to let John leave with some dignity; instead, they hack him to bits and shoot him." I don't know if you surf the Internet at all, but the Clone Saga has not always had the best rap. The thing that struck me in reading various things on the Internet is that people would complain about the Clone Saga, and then go on about how wonderful Ben Reilly was. There is a big movement of "Bring Back Ben Reilly" folks. Of course without the Clone Saga, there would be no Ben Reilly, so I found that very curious. Just guessing, but people tend not to like it when the character they like better is killed off in favor of the status quo. The last Star Trek TV series had a lot of trouble finding its footing. 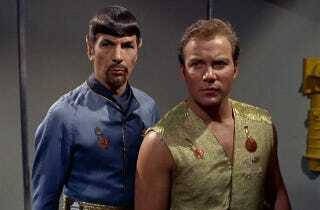 But it had no trouble capitalizing on the Star Trek's infamous mirror universe. "In a Mirror, Darkly" was by far on of Enterprise's best episodes. From the revised opening credits on, the two-parter managed to be more engaging than whole seasons of Enterprise. We would have had no qualms with ditching the original universe entirely for this version.